As Foster The People ended their set on the Samsung Galaxy stage, people flooded out and ‘Kast fans began to flood in. As I made my way up to the front, I simply tried to dodge any lingerers who were unsure of where they would land. My only goal was to get as close as possible to the stage, as I figured that’s where the majority of their die-hard fans would attempt to go as well. Settling down remarkably close, I set up position on the right side of the stage and watched as the crew set up shop. Anticipation built for that transitional hour until everything was just right. The final touch was putting up a large cloth over a very large cube that would eventually become their entrance point. The lights went out, the banner changed to reflect the now infamous Stankonia album cover (the black and white USA flag,) and you could hear a familiar voice yell out “CHICAGOOOOOOOO!” Big Boi and André 3000 were ready to start the show. The ­­­­instantly recognizable synth introduction of B.O.B. began playing, and at that moment, you immediately knew you were in for one hell of a show. The banner dropped and Dré plunged right in to the anthem that arguably skyrocketed the duo from relative unknown status to international superstardom. From the jump, you could see that their rumored lack of chemistry was a thing of the past. The two navigated around each other seamlessly; as if they had never “broken up” in the first place. After B.O.B. concluded, the two had some words for the crowd, and went back into a flurry of classic album cuts. They said they were doing this next segment for the die-hard fans, and they meant every word of it. Gasoline Dreams of Stankonia fame made an appearance, and that was followed up by Skew It On The Bar-B. The only thing missing from that performance was Wu-Tang Killa Bee Raekwon The Chef, whose verse on there is timeless to say the least. From there, it was only right follow it up with Rosa Parks. While it didn’t get quite the reaction I anticipated, it was still a crowd pleaser none the less. Hip hop fans everywhere rejoiced when they did the underrated and underappreciated Da Art of Storytellin’ (Part 1.) It was at this moment that I could see the crowd really process what they have seen, and what they were about to continue witnessing. This was not going to be a performance of only their popular songs, but OutKast was going to deliver an all encompassing set to the masses in order for fans of all spectrums to truly appreciate them as a whole. 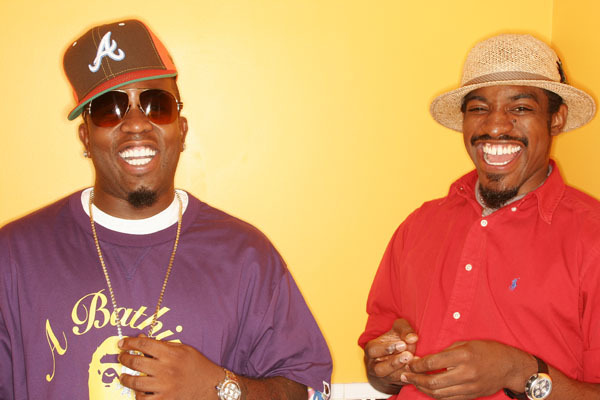 Regardless of what you wanted, this was the OutKast that you needed to hear. The hits kept rolling as they transitioned seamlessly from the title track Aquemini, the unexpected SpottieOttieDopaliscious (which featured a dope appearance from a pajama-suit clad Sleepy Brown,) and a crowd favorite with Ms. Jackson. At this point, André 3 Stacks vacated the stage and allowed Big Boi to flex some of his own solo material from their Speakerboxxx/The Love Below era. Given the opportunity to shine, what does Big Boi decide to throw on first? The celebrated crunk classic Kryptonite. In an instant, you knew things were about to get funky. At this point, the crowd went into a frenzy. People were jumping around in pure ecstasy all around me, and everyone was captured in the moment. Nowadays, most people spend most of their concert time recording videos, sending Snapchats, texting, etc., so it was nice to see that people were actively engaged in being caught up in the moment; an especially rare sight given the age range of most patrons. The pace never let up after Kryptonite, with Sir Lucious Left Foot giving the fans GhettoMusik next, and ending his solo set with The Way You Move. The crowd was in an uproar at this point, and now it was 3000’sturn to move the crowd. He did, but it was a very different energy. After the uptempo grooves of The Way You Move, it was an abrupt shift for Dré to start his set off with She Lives In My Lap. It’s a great song in its own right, but it felt a bit out of place. Prototype fared better amongst the crowd, as it was basically used for couples to make out for five minutes. It was cute, but if felt unnecessary given the tone that had been set throughout the entire show until that point. Things picked up in grand fashion when he rounded out his three-track solo set with Hey Ya. With about 10 women in tow, André rocked the crowd in a way only he could. One of the dancers was actually Chicago’s own artist Nikki Lynette. How she got to that stage? I have no idea, but it was still really cool to see. After the ladies were individually thanked and escorted off the stage, The Son of Chico Dusty returned to close out the show. After a disclaimer stating “in case y’all didn’t know, we’re rappers too,” the duo took it all the way back to 1994 with Hootie Hoo, Crumblin’ Erb, Southernplayalisticadillacmuzik and Player’s Ball. Next up was Elevators (Me & You) which easily got the older crowd swaying to the infectious beat, and that was succeeded by Roses. The Roses performance was so spot on that I was expecting Fonzworth Bentley to float onto the stage donning one of his signature umbrellas. Sadly, that did not happen, but an awesome performance of So Fresh, So Clean did. Everybody was feeling a bit pimp-ish as that was playing, and it was a perfect (near) conclusion to the show. After a brief break to interact with the crowd, the Georgia boys dedicated Int’l Players Anthem to the late Pimp C. Finally, they gave the crowd one of their biggest hits to date with The Whole World (sans Killer Mike.) The song ended, they said their goodbyes, and just like that, they were gone. One thing that I appreciated greatly is that they performed nearly every song in their entirety. In the stop-and-go, instant gratification era we currently live in, I expected them to do the typical song medley every now and then to remind people of just how many incredible songs they have made together. However, we got to fully digest every track of their 23-song set list, and it made for a greater concert experience overall because of it. While seminal classics such as Git Up, Get Out, Wheelz of Steel, ATLiens, Tomb of the Boom, Spread, and Vibrate (or anything from the Idlewild album for that matter) did not get a proper light shined upon them, the wealth of cuts we did get out of them more than made up for it. It’s sad to think that this tour could possibly be the last time the world gets to see the two perform on the same stage together. I understand that good things don’t last forever, but it would be reassuring to know that they would be willing to do this again at some point. If not, at least I got to finally see them live after a 20 year wait. If you are still on the fence about seeing them, you should put all reservations you have rest right away. It was an incredible show put on by two incredible performers. Nothing more, nothing less. While I do not have any hope that the two will ever put out another album together, I think the world would be a better place if they considered doing festival tours every once in a while. In the end, I’ll gladly take what I can get, and to Antwan “Big Boi” Patton and André “3000” Benjamin, I say stank you. Stank you smelly much.